Children are now spending an average of just over two hours a day online, and a new study by Ofcom highlights the reasons young people are drawn to video services such as Netflix and YouTube. 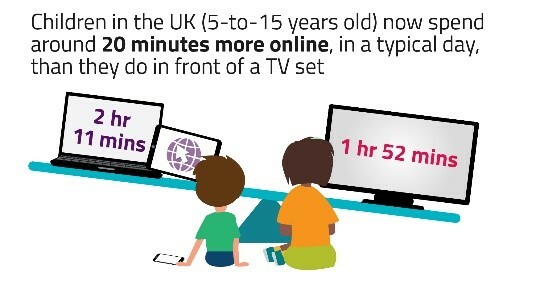 Our annual study of media use found children in the UK (aged 5 to 15) now spend around 20 minutes more online per day than they do in front of a TV set – just over two hours online, and a little under two hours watching TV. In 2018 children’s online time stopped growing for the first time, at an average of 2 hours 11 minutes per day. But year on year their average daily TV time has fallen by almost eight minutes, to an estimated 1 hour 52 minutes. YouTube is still the main online destination for children, with four in five children having used it. Nearly half of children, and a third of pre-schoolers aged 3 to 4, now watch services such as Netflix, Amazon Prime Video and Now TV. Among those who watch both YouTube and TV programmes on a TV set, nearly half of children aged 8 to 11 and older children aged 12 to 15 prefer watching content on YouTube. However, more than a third get the same enjoyment from both viewing experiences. To help understand why children are drawn towards online content, we carried out a detailed study of children’s viewing. Live TV is parent-led, and often reserved for family time. Most of the children watched live, scheduled TV, though only a small number did so daily. Live TV viewing was often led by parents, allowing the family to come together to watch soaps, quizzes or ‘appointment viewing’ such as Strictly Come Dancing or The X-Factor. Hobbies and passions. Lots of children watched videos related to offline interests such as music or football. Some enjoyed watching others doing activities so much that they said they no longer took part in these activities themselves. Sensory videos. Many children enjoyed videos such as other people making and playing with slime, or opening presents. Yih-Choung Teh, Strategy and Research Group Director at Ofcom, said: “Children have told us in their own words why online content captures most of their attention. These insights can help inform parents and policymakers as they consider the role of the internet in children’s lives. Our research also found older children are finding it harder to control their screen time than they were last year. The proportion of 12- to 15-year-olds who said they found it difficult to moderate their screen time has increased to a third (35%), up from a quarter (27%) the year before. Seven in ten older children (71%) said they are allowed to take their mobile phone to bed. But in spite of these challenges, around two-thirds of 12- to 15-year-olds felt they achieved a good balance between screen time and doing other things.